When I posted about the World’s Championship Horse Show in Louisville [Radio Silence], Writing From the Right Side of the Stall asked why the shavings are green. The color is iconic. The phrase “green shavings” refers to L’ville the way “Rolex” refers to the Rolex Kentucky Three-Day Event. First time riders will often take a handful of shavings home to display as a trophy. When I couldn’t find the answer, I asked the source, Feeder’s Supply. Thanks for your interest in the green shavings supplied by Feeders Supply to the Kentucky Expo Center! We are very proud of that product. The green shavings were “created” by Roy Gibson, the founder of Feeders Supply Co. The company had secured a contract with the Kentucky Expo Center in the early 1970s and was supplying feed and bedding for the livestock events at the KEC. Roy was asked to come up with something special for the show ring. After much experimentation and sourcing of just the right colorings, the green shavings were born. It was important that the coloring used would not stain the animals’ feet and it needed to be safe in case an animal consumed any of it. Plus, it needed to adhere to the wood shavings so that the show rings would stand up to the use of hundreds of show animals. The green color was not in common use at that time. Thus was born the “tradition” of the green shavings at the Kentucky Expo Center shows. Today, when people in the livestock business see a photo or video of a show on green shavings, they most times assume that it was happening in Louisville. What they don’t know is that all the shavings come from Feeders Supply! Thank you Linda for a prompt and informative response. According to the webpage, the green shavings are not unique to the World’s Championship. We also supply feed, bedding and our famous green shavings for the Kentucky State Fair, the North American Livestock Show, the Arabian Horse Show and 4-H exhibitions. But, don’t try telling that to a saddleseat rider! 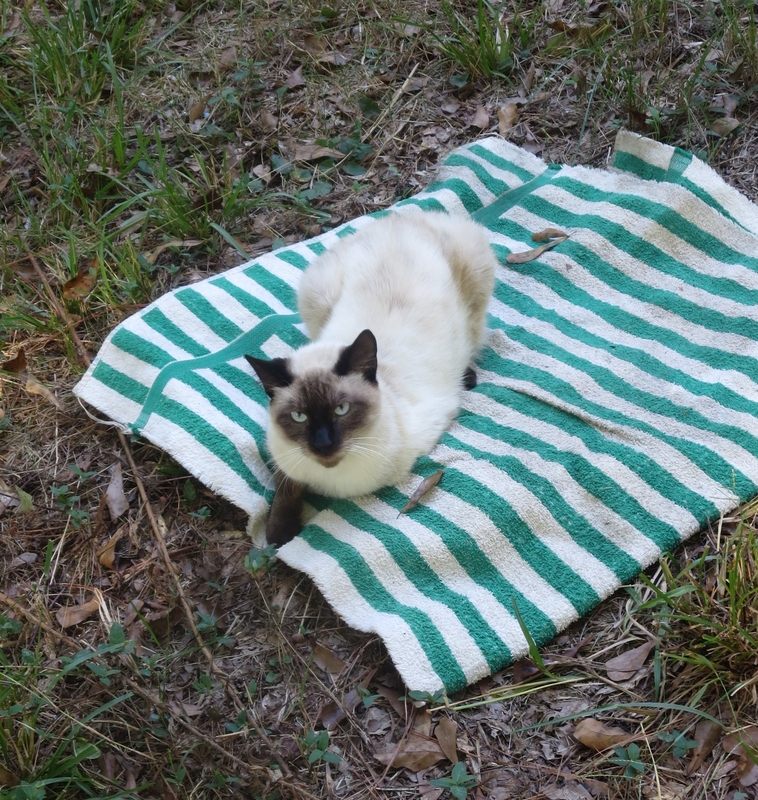 Yes, we have a towel deliberately placed in the middle of the front lawn so that Pudge has a place to sleep. Your point? Humbled am I that you went so far as to track down and interview the source. One question remains unanswered, though. Why green as opposed to mauve or cerise? Thank you for the GCP.